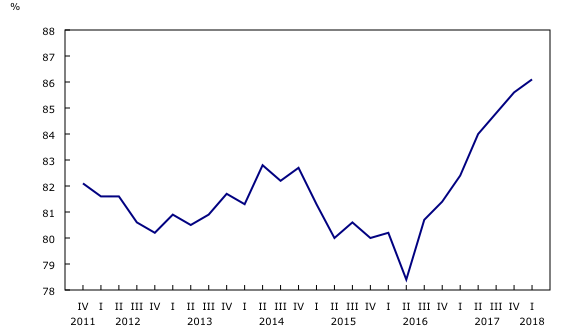 Canadian industries operated at 86.1% of their production capacity in the first quarter, up from 85.6% in the previous quarter. This was the seventh consecutive quarterly gain and the longest sequence of increases since the third quarter of 2009 to the first quarter of 2011. The increase in the first quarter of 2018 was mainly attributable to the construction sector and, to a lesser extent, the manufacturing sector. The capacity utilization rate in the construction industry posted a seventh consecutive quarterly increase, rising from 90.8% in the fourth quarter to 92.4% in the first quarter. As in the previous quarter, the gain was due to a widespread increase in construction activity. Conversely, the capacity utilization rate in the forestry and logging industry decreased from 87.0% to 85.6% in the first quarter, the fifth decline in six quarters. The capacity utilization rate of manufacturing edged up 0.4 percentage points in the first quarter to 86.1%. This was the seventh consecutive quarterly increase and the highest level since the fourth quarter of 2000. As in the previous quarter, durable goods manufacturing industries continued to be the main sources of the gain. Among transportation equipment manufacturers, the capacity utilization rate rose from 83.6% in the fourth quarter to 85.6% in the first quarter, led by motor vehicle and motor vehicle parts manufacturing, and other transportation equipment manufacturing. This was the second quarterly increase following a large decline in the third quarter of 2017. Transportation equipment manufacturers have not had back-to-back increases since the first and second quarters of 2012. The capacity utilization rate of the machinery manufacturing industry rose for the seventh consecutive quarter, up 2.5 percentage points to 90.2% in the first quarter on widespread production increases in every subsector of the industry. The overall gain in the manufacturing sector was partly offset by some declines, particularly in the wood product manufacturing industry. After rising 4.1 percentage points in the fourth quarter, the capacity utilization rate in the wood product manufacturing industry declined for the first time in seven quarters, falling from 94.0% in the fourth quarter to 91.7% in the first quarter on widespread production declines. The United States imposed final countervailing and anti-dumping duties on Canadian softwood lumber in January. Primary metals manufacturing, which includes aluminum and steel manufacturing, declined 1.1 percentage points to 81.2% in the first quarter, the first decrease in four quarters. The industrial capacity utilization rate is the ratio of an industry's actual output to its estimated potential output. For most industries, the annual estimates are obtained from the Annual Survey of Manufacturing and Logging Industries, while the quarterly pattern is derived from the output-to-capital ratio series—the output being the real gross domestic product at basic prices, seasonally adjusted, by industry. This program covers all manufacturing industries, as well as forestry and logging, mining, quarrying and oil and gas extraction, electric power generation, transmission and distribution, and construction industries. 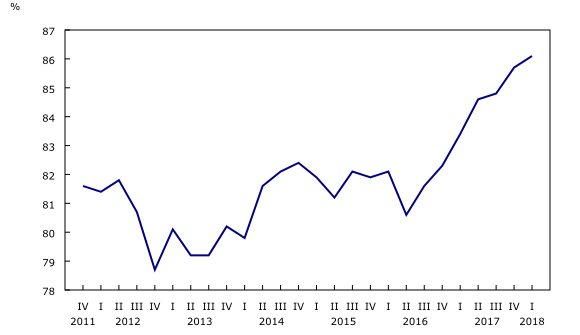 With this release of industrial capacity utilization rates, the data have been revised back to the first quarter of 2017 to reflect the latest revisions to the source data. Data on industrial capacity utilization rates for the second quarter will be released on September 12.